The following are facts that will help you to prevent, address, and treat eating disorders or dysfunctions in your child, student, patient, or loved one. Fat is unhealthy for the body. Dieting and restricting food is the best way to lose weight. It's okay to skip meals. Food substitutes such as Power Bars and Slim Fast are okay to use in place of meals. Meals need to be served, not necessarily eaten by, parents. Exercise can keep a person slim and fit. You can never overdo such a good thing. Becoming overly large is about being unhealthy, unhappy and unattractive. It must be avoided at all costs. Fat-free eating is healthy eating. A meal is anything you put in your mouth around mealtime. Once anorexic, always anorexic. Like alcoholism, eating disorders are not curable. Anorexics are easy to identify. They are noticeably skinny and don't eat. Once an anorexic has achieved a normal weight, she is recovered. An eating disorder is about eating too little or too much. Parents are the cause of their child's eating disorder. Eating disorders affect only upper class adolescent girls. People lose weight through using laxatives and diuretics. Physicians can be counted on to discover and diagnose an eating disorder. Of the currently more than 11 million Americans afflicted with eating disorders, 87 percent are children and adolescents under the age of twenty. 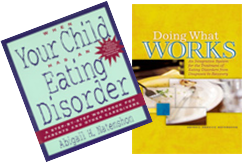 The average age of eating disorder onset has dropped from ages 13-17 to ages 9-12. In a recent study, young girls were quoted as saying that they would prefer to have cancer, lose both their parents, or live through a nuclear holocaust than to be fat. 81% of 10 year olds are afraid of being fat. The US Dept of Health and Human Services task force reports that 80% of girls in grades 3 to 6 displayed body image concerns and dissatisfaction with their appearance. By the time girls reached the 8th grade, 50% of them had been on diets, putting them at risk for eating disorders and obesity. By age 13, 10% had reported the use of self-induced vomiting. 25% of first graders admit to having been on a diet. Statistics show that children who diet have a greater tendency to become overweight adults. Childhood obesity is at an all time high, afflicting five million children in America today, and with another six million on the cusp. Healthy eating is the solution. Early puberty and the bodily changes that go along with it (starting at around age 9) have become a primary risk factor for the onset of eating disorders. It is normal, and in fact, necessary, for girls to gain 20 percent of their weight in fat during puberty. The number of males with eating disorders has doubled during the past decade. By the age of five, children of parents who suffer with eating dysfunctions demonstrate a greater incidence of eating disturbances, whining and depression. Adolescents with eating disorders are at a substantially elevated risk for anxiety disorders, cardiovascular symptoms, chronic fatigue, chronic pain, depressive disorders, infectious diseases, insomnia, neurological symptoms, and suicide attempts during early adulthood. A study of 692 adolescent girls showed that radical weight-loss efforts lead to greater future weight gain and a higher risk of obesity. Eating disturbances in your very young child may be the result of anxiety, compulsivity, in connection with the child's imitation of significant adult role models. Issues of control, identity, self-esteem, coping and problem solving are what tends to drive adolescent and adult eating disorders. 50% of American families do not sit down together to eat dinner. The number of people with eating disorders and subclinical eating disorders is triple the number of people with AIDS. Eating disorders are the most lethal of all the mental health disorders, killing and maiming between 6 and 13 percent of their victims. Increasing numbers of married and professional women in their twenties, thirties, forties and fifties are seeking help for eating disorders that they have harbored secretly for decades. Eating disorders are not restricted to the young. Disordered eating is rampant in our society. On American college campuses today, 40 to 50 percent of young women are disordered eaters. Osteopenia is common in adolescent girls with anorexia nervosa. It was found that despite recovery for over one year, poor bone mineral accrual persists in adolescent girls with AN in contrast to rapid bone accrual in healthy girls. In a recent study, it was determined that estrogen-progestin did not significantly increase BMD compared with standard treatment. These results question the common practice of prescribing hormone replacement therapy to increase bone mass in anorexia nervosa. Many parents fear that through honest intervention with their child about food and eating, they could make matters worse or lose their child's love. They worry that they may interfere with their child's privacy and developing autonomy by stepping in to rectify an eating problem in the making. Parents need to recognize that a problem cannot be resolved unless and until it is identified and confronted. Some health professionals believe that parents do not belong in their child's treatment for eating disorders. Professionals' concerns about the issues of separation/individuation and protecting the child's privacy too frequently blind them to the need to educate and guide parents, through the family therapy process, to become mentors to their child, supportive of recovery efforts. The most successful separation takes place through healthy bonding. 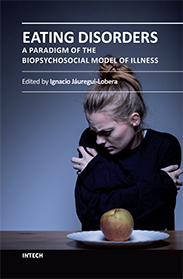 "Anorexia Strategy: Family as Doctor" - "When a teenage girl develops anorexia, a team of experts usually takes charge of bringing her back to a normal weight, while her parents stand on the sidelines... The goal of the therapy is to mobilize the family as a whole in a fight against the eating disorder." Dr. James Lock, assistant professor of psychiatry at Stanford School of Medicine. The New York Times; June 11,2002. Too many or too few parental limits imposed during the growing up years deprive children of the opportunity to internalize the controls they need to ultimately learn to regulate themselves. These children may eventually turn to an eating disorder to compensate; nature abhors a vacuum.